CAMBRIDGE - Big plans are afoot at a small music school. In June, the Longy School of Music officially merged with Bard College. Over the last year, merger news competed with headlines generated by the school’s battle with its own faculty members that had been laid off as part of a pre-merger restructuring. As that conflict seems to be receding, Longy and Bard have grown more public in discussing their new relationship. 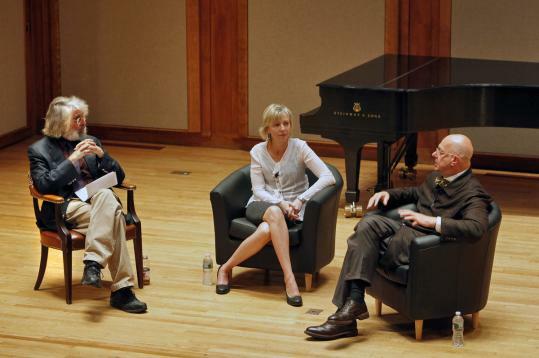 As a kind of symbolic opening to the new chapter, the school’s annual fall concert series, SeptemberFest, began on Friday night with Karen Zorn and Leon Botstein, the presidents of Longy and Bard respectively, on the stage of Pickman Concert Hall, speaking with the Boston Phoenix’s classical music editor Lloyd Schwartz about joint institutional ambitions, and about the future of music education more broadly. With Bard’s main campus located in the New York’s Hudson Valley, this will be a long-distance relationship between the two schools, but probably more important than geographic closeness is the proximity of approach. Both schools seem to have an enlarged vision for what training musicians of the future might look like, Bard with its conservatory that emphasizes music’s connection to the other liberal arts, and Longy, with its focus on connecting musicians with the communities in which they live. “Music can no longer be taught as an athletic or self-referential exercise,’’ Botstein said on Friday, with the ring of a shared declaration. The most hopeful elements of the panel discussion in fact centered on redefining the role of the music teacher. Both Botstein and Zorn seemed to recognize the excessively wide gap between careers in music education and performance, between those who teach music and those who make it. Longy will now develop a master of arts in teaching based on a newer, more holistic model of the performer-educator. On another hopeful note, Botstein and Zorn also said Longy and Bard would be exploring plans for an additional masters program, possibly offered over three summers, in which performance training was mixed with curatorial studies in history and criticism, aiming to create musicians who can think and talk about music - and program it - as capably as they play it. Many of Longy’s new offerings are still under development, but one unexpected program has already hit the ground. Zorn said on Friday that Longy, as of last month, has been running an El Sistema-inspired nucleo on the campus of a Bard-backed charter school in the city of Delano, Calif. The newly launched music program at Paramount Bard Academy is designed to teach mariachi music to local children, many of whom come from families working in the region’s farming industries. Closer to home, beyond Longy’s popular community programs (which school leaders say will continue), how will the merger affect Longy’s place in the greater Boston musical ecosystem? It’s too early to know, but one hopes that the school’s public concert offerings, too, can be fruitfully reimagined. Longy had a smart idea with the five-concert SeptemberFest, which occupies an otherwise quiet stretch between the end of the summer season and the beginning of the fall concert rush. Friday’s opening night performance, however, was a curiously unfocused program that rambled from the baroque to new music (an attractive new piece by John Morrison) to extended saxophone technique to a smattering of pieces by John Cage and a quartet by Haydn. It was hard to avoid thinking about potential new directions for this annual festival, especially given the merger. For years at Bard, Botstein and colleagues have convened an annual summer festival with some of the most intellectually engaging programming around. Why not carve out a niche for Bard Festival-style public events at Longy? With all of Boston’s local universities, it’s hard to imagine a place more potentially receptive to the programming approach Botstein has championed at Bard and at the American Symphony Orchestra, which he also directs. In the meantime, Longy’s fall concert calendar is not exactly free of surprises. One of them is a recital on Oct. 10 with violinist luminary Gidon Kremer performing Bach, Shostakovich, and contemporary works with two colleagues - a coup for a small school. After Kremer in Pickman Hall and mariachi in California, what will come next for Longy? It’s hard to guess, and that, for starters, is a good thing. Much of the ultimate success or failure of Longy’s plans will of course depend on how they are realized, and whether the school can preserve the essential elements of its older identity while making room for bold changes. But after years of being overshadowed by Boston’s other music schools, it’s clearly a wise move for Longy to be raising its ambitions and reaching toward a broader context for its own future.